Since I live in Northern California, I’m lucky enough to be able to visit the Monterey Bay Aquarium, pound for pound the best aquarium in the United States. (Sorry, partisans of the National Aquarium in Baltimore.) A trip to Monterey’s aquarium never fails to fill me with a sense of wonder at the diversity of life that teems just beneath the ocean’s surface and an appreciation for our natural resources. It also makes me very, very hungry for seafood. 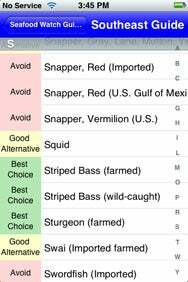 See Food: The Monterey Bay Aquarium’s Seafood Guide lets you see at a glance which fish to avoid and which fish are OK to eat, though some information—like the red snapper listing pictured—is not always entirely visible. I think the Monterey Bay Aquarium understands this particular duality—the desire to both appreciate and munch on our planet’s sea critters—because the aquarium hands out pocket-sized Seafood Watch guides. These handheld pieces of paper have the skinny on sustainable seafood—fish that’s farmed or caught responsibly without a negative impact on the environment. The guides are handy for when you’re picking up fish at the local supermarket or sitting down to a nice meal at a nearby restaurant—a quick glance at the Seafood Watch guide, and I can be reasonably confident that the only cost associated with what I’m ordering is the dollar amount on my receipt. The downside to the Seafood Watch guide? It’s not much good if you don’t carry it around with you. And since these are foldable guides, it’s frighteningly easy to leave them in a coat pocket when you’re out and about. Also, there are different guides for different parts of the country—that’s a lot of paper to carry around just to find out if that salmon you were planning on ordering at that business dinner in Boston is as A-OK as it is back home in California. But the Monterey Bay Aquarium figured out a solution to these shortcomings—mobility in the form of a Seafood Guide for the iPhone and iPod touch. All the critical information you’d get from the paper guide is there, stored on a device you’re unlikely to leave behind. The mobile Seafood Guide contains a national guide, along with six regional guides (for the central U.S., the northeast, southeast, southwest, west coast, and Hawaii). There’s also a sushi guide that lists the fish by their Japanese name as well as the common market name, just in case you can’t tell a hirame from a maguro. The mobile version follows the same color-based warning scheme as the paper Seafood Watch guide. Your best choices are accompanied with a green dot, while a yellow dot signifies a good alternative. Fish to avoid—either because they’re overfished or raised in an unsustainable way—get a red marking. But the app also takes advantage of some iPhone-specific features. It lists fish alphabetically, but you can use an A-to-Z listing on the right side of the screen to jump to a specific letter, saving yourself scroll time. The Seafood Guide listings also offer more detail on the iPhone. Tap an entry, and you get a brief summary of the fish, some consumer notes on common market names and fishing methods, and, in some cases, a picture. The added detail is particularly helpful in explaining the differences in fishing methods—troll/pole versus longline, say—and how they affect the sustainability of seafood. 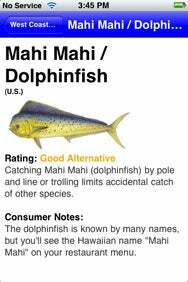 Meet the Mahi: Tap on a Seafood Guide entry, and you get more detailed information about the fish, including—in many cases—a picture. Which is not to say that Seafood Guide is without its flaws in iPhone form. Entry titles that list regions or fishing methods can be lengthy enough to spill off the screen. When you’re dealing with multiple varieties of the same kind of fish, it’s impossible to see some of the most pertinent details. The West Coast Guide, for example, has two listings for albacore—one for British Columbia and the U.S. caught by troll/pole fishing and the other for worldwide albacore (except in Hawaii when it’s caught via longline). The former is A-OK, while the latter is verboten, but on the iPhone’s screen most of the distinctions and caveats between the different forms of albacore are cut off. The developer should figure out a way to make all that pertinent information visible at a glance—perhaps by adding a landscape orientation. Also, as detailed as individual entries are, there’s no bar on the side to let you know that more information awaits you if you scroll down; that bar only appears when you make a scrolling motion with your finger. Those complaints aside, Seafood Watch is a helpful mobile reference guide. If you believe in the importance of eating sustainable seafood, it deserves a place on your iPhone or iPod touch. Seafood Guide is compatible with any iPhone or iPod touch running the iPhone 2.2 software update.